5, 10 or 15 metres of flow and return refrigerant copper pipe the sizes being 1/4 and 3/8. 5, 10 or 15 metres of flow and return refrigerant pipework insulation. Pipe flaring tool and cutters. Remember a lot of supposed kits do not contain all the required parts to install! 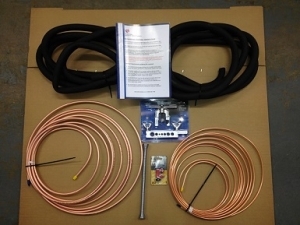 Our kit includes all the necessary flaring and bending tools to complete the job. And most importantly full illustrated instructions written by our engineers. If you are unsure about which Kit to order please ring or Email us with the system you are looking to purchase a kit for, we can then advise on the appropriate kit and price.